Objectives: Craniovertebral junction (CVJ) can be approached from various corridors depending on the location and extent of disease. A three dimensional understanding of anatomy of CVJ is paramount for safe surgery in this region. Aim of this cadaveric study is to elucidate combined microscopic and endoscopic anatomy of critical neurovascular structures in this area in relation to bony and muscular landmarks. Materials and Methods: Eight fresh frozen cadaveric heads injected with color silicon were used for this study. A stepwise dissection was done from anterior, posterior, and lateral sides with reference to bony and muscular landmarks. Anterior approach was done endonasal endoscopically. Posterior and lateral approaches were done with a microscope. In two specimens, both anterior and posterior approaches were done to delineate the course of vertebral artery and lower cranial nerves from ventral and dorsal aspects. Results: CVJ can be accessed through three corridors, namely, anterior, posterior, and lateral. Access to clivus, foreman magnum, occipital cervical joint, odontoid, and atlantoaxial joint was studied anteriorly with an endoscope. Superior and inferior clival lines, supracondylar groove, hypoglossal canal, arch of atlas and body of axis, and occipitocervical joint act as useful bony landmarks whereas longus capitis and rectus capitis anterior are related muscles to this approach. In posterior approach, spinous process of axis, arch of atlas, C2 ganglion, and transverse process of atlas and axis are bony landmarks. Rectus capitis posterior major, superior oblique, inferior oblique, and rectus capitis lateralis (RCLa) are muscles related to this approach. Occipital condyles, transverse process of atlas, and jugular tubercle are main bony landmarks in lateral corridor whereas RCLa and posterior belly of digastric muscle are the main muscular landmarks. Conclusion: With advances in endoscopic and microscopic techniques, access to lesions and bony anomalies around CVJ is becoming easier and straightforward. A combination of microscopic and endoscopic techniques is more useful to understand this anatomy and may aid in the development of future combined approaches. Keywords: Craniovertebral junction; endoscopic endonasal; rectus capitis lateralis; vertebral artery. Craniovertebral junction (CVJ) is osteoligamentous membranous complex formed around the transition zone of neuraxis between brain and spinal cord. Layers of muscles, ligaments, and membranes support bony complex of occiput, atlas, and axis from all around which helps in adding mobility as well as stability to this critical area. Major neurovascular structures are intimately related to this area of transition where they transverse membranous and bony orifices. CVJ can be affected by congenital, developmental, degenerative, traumatic, and neoplastic pathologies. To manage these pathologies, various approaches have been described in literature.,,,,,,,, With recent advances in endoscopic technology, there is renewed interest in direct anterior approach to ventrally located pathologies.,,, There are many recent cadaveric and surgical studies validating the feasibility of endoscopic approaches.,,,,,, However, all these studies describe this anatomy in isolation either endoscopic or microscopic. Being a complex area circumventing 360° with multiple joints, a three dimensional (3D) understanding of this anatomy is crucial for safe surgeries in this region. In the present anatomical study, we have described the relation of critical neurovascular structures such as vertebral artery (VA) and lower cranial nerves in relation to various bony and muscular landmarks from anterior, posterior, and lateral corridors. Eight cadaveric specimens were prepared for dissection at the neuroanatomical laboratory of the Neurosurgical Department at the University of Pittsburgh School of Medicine. The common carotid arteries, VAs, and internal jugular veins (IJV) were isolated, cannulated with flexible tubing, and dyed with red or blue water soluble pigments using previously described methods. Cadaver heads in which the vessels were injected with colored silicone were dissected using ×2.5 to ×10 magnification of a surgical microscope (Carl Zeiss AG, Oberkochen, Germany), and 4 mm, 0° and 45° angle, 18 cm Hopkins endoscopes (Karl Storz GmbH and Co. KG, Tuttlingen, Germany), attached to a xenon light source (Xenon Nova 175, 20131520; Karl Storz GmbH and Co. KG, Tuttlingen, Germany), a high definition camera (model 22220150; Karl Storz GmbH and Co. KG, Tuttlingen, Germany), an electric drill (Stryker GmbH and Co. KG, USA), and standard microsurgical instruments. Images were acquired using a Canon T4i DSLR camera (Canon Corp., Tokyo, Japan). The anatomic approaches in this study were divided into three corridors: Anterior, posterior, and lateral. Anterior dissection was predominantly carried out by endoscope whereas posterior and lateral corridors were mainly studied by microscopic approach. Anterior approach to ventral CVJ and brainstem is a direct approach without traversing critical neurovascular structures. Anterior access is a direct approach to clivus, foramen magnum, occipitocervical joint (OC1), anterior arch of atlas, and odontoid process of axis [Figure 1]. Anterior corridor was studied by endonasal endoscopic technique. It was divided into four stages: nasopharyngeal, muscular, osteoligamentous, and intradural. Standard endoscopic endonasal approaches to CVJ require creating a more wide surgical corridor. Removing middle turbinate from one side and lateralizing on the other side can create this. Access to foramen magnum and CVJ requires low trajectory compared to sellar approaches [Figure 2]. Posterior nasal septum, inferior sphenoid wall, and vomer are removed to reach rhinopharyngeal part of clivus. Bone over clivus and carotid protuberance is drilled and removed depending on the level of exposure [Figure 2]a. Lateral limit of exposure is carotid protuberance, foramen lacerum, vidian canal, and eustachian tube (ET) from upward below [Figure 2]a. Nasopharyngeal mucosa is removed, widely exposing the underlying basipharyngeal fascia and median raphe covering prevertebral muscles [Figure 2]b and [Figure 2]c. Two muscles cover this area anterior to foramen magnum and extend from clivus downward: Longus capitis and rectus capitis anterior (RCpA). More medial is longus capitis which extends as four tendinous slips from anterior tubercles of transverse processes of III, IV, V, and VI cervical vertebrae and ascend upward to get attached to clivus between the superior and inferior clival lines [Figure 2]d. Longus capitis is removed and has multiple bellies [Figure 2]e. Atlanto occipital membrane (AOM) is a broad, dense fibrous structure that extends from the anterior edge of the foramen magnum to the superior edge of the anterior arch of the atlas [Figure 2]f. Median raphe is a thick band of connective tissue, which is attached to pharyngeal tubercle in the midline at clivus and continues below as anterior longitudinal ligament [Figure 2]f. RCpA is another short muscle immediately behind longus capitis arising from the anterior surface of the lateral mass and root of transverse process of atlas, passing obliquely upward to be inserted between inferior clival line and foramen magnum in supracondylar groove [Figure 2]g and [Figure 2]h. These muscles create two well defined lines of attachment on the ventral surface of the lower clivus, namely superior clival line (for the longus capitis) and the inferior clival line (for the RCpA) [Figure 1]c and [Figure 2]h. This is comparable to the attachment of the neck muscles on the dorsal surface of the occipital squama, where they create the superior (for the splenius capitis and sternocleidomastoid) and inferior (for the semispinalis) nuchal or occipital lines [Figure 1]a and [Figure 1]b. Importantly, the inferior clival line or supracondylar groove provides a reliable landmark for estimating the position of the hypoglossal canal and its external orifice, which are situated just posterior and lateral to the groove, respectively [Figure 1]h and [Figure 2]h., AOM and anterior median raphe are removed to expose foramen magnum, OC1 joint, and anterior arch of atlas [Figure 2]h. Space between foramen magnum and anterior arch of atlas is filled with dens connective tissue and contains apical ligament and alar ligaments [Figure 2]i. Anterior arch of atlas is removed partially to expose odontoid process with attached ligaments [Figure 2]j. The atlas has two lateral masses connected by anteriorly convex, anterior arch having a midline anterior tubercle and by a posterior surface that articulates with the anterior surface of the odontoid process [Figure 1]d and [Figure 1]e. The alar ligaments are thick fibrous bands that arise from the posterolateral roughened surface of the odontoid and ascend obliquely, laterally, and superiorly toward the alar tubercle on the medial side of the occipital condyles [Figure 2]k. The apical ligament of the dens has a broad cartilaginous base that arises on the apex of the dens and extends to the anterior border of foramen magnum [Figure 2]h. Posterior surface of dens also has a posterior facet that articulates with the cartilaginous facet on the anterior surface of the cruciform ligament. The anterior cortical surface and core of the dens are drilled, leaving only a thin shell of bone, which can be removed with rongeurs [Figure 2]k. It is not always possible to remove the base of the dens with this approach. Removal of dens exposes thick, white, strong band called transverse ligament, which arches posterior to dens and holds it in position [Figure 2]l. It extends from tubercles on the medial side of the lateral masses of atlas. This ligament is usually broad in middle and taper laterally [Figure 2]m. Transverse ligament is the horizontal part of cruciform ligament which has two upper and lower vertical bands. The upper vertical band of the cruciform ligament arises from the median part of the superior edge of the transverse band and ascends between the tectorial membrane and the apical ligament to insert on the intracranial surface of the clivus. The lower vertical band descends from the lower margin of the transverse ligament and inserts on the posterior surface of the body of the axis [Figure 2]l., Approximately, 8%–20% of CVJs another transverse band of ligament maybe present just above the transverse ligament attached to the medial side of occipital condyles and it is called transverse occipital ligament [Figure 2]m., This can sometimes be confused with transverse ligament. The tectorial membrane, a broad fibrous band that spans the area between the medial edges of the occipital condyles, is a rostral extension of the posterior longitudinal ligament that attaches to the axis inferiorly and the clivus superiorly. It is separated from dura by epidural venous plexus. Once dura is opened, the junction of spinal canal with medulla is exposed, which is defined as being at the level of origin of C1 ventral roots [Figure 2]n. The initial intradural segment of VA is also exposed along with its relation to XII nerve rootlets as they arise from preolivary sulcus of medulla. Both VA join to form basilar artery close to pontomedullary junction and can be visualized. Clivus is thick central portion of bone formed by synchondrosis of basisphenoid and occipital bone and extend from dorsum sella to foramen magnum [Figure 1]c and [Figure 1]h. On sides, it is separated from petrous part of temporal bone by petroclival fissure that extend from foramen lacerum to jugular foramen [Figure 1]h.
Clivus is divided into three parts: Superior, middle, and inferior. The superior portion is located above the level of the sellar floor; the middle portion extends from the sellar level to the level of sphenoid floor; and the inferior portion from the sphenoid floor to the foramen magnum. Grossly, the petroclival fissure that extends from the foramen lacerum to the jugular foramen borders the clivus laterally. According to the level of clivus, various areas of posterior fossa can be accessed. ET, foramen lacerum, and paraclival internal carotid artery (ICA) limit lateral extent of exposure in this approach from below upward [Figure 3]a. Basilar venous plexus extends variably between the layers of dura and can be a source of bleeding during drilling of clivus. Dura covering clivus is supplied by dorsal clival artery, which is the branch of meningohypophyseal trunk arising from cavernous ICA [Figure 3]b. This artery also gives branch to interdural segment of VI nerve and forms arterial network with branch from opposite side. This artery can be the source of blood supply to meningiomas and other extradural lesions arising in this area. One needs to be careful about trajectory of VI nerve in the upper clivus which takes acute course to enter cavernous sinus; this segment lies medial to paraclival ICA and it is prone to injury while approaching lesions around petrous apex [Figure 3]b. More lateral exposure can be obtained in the middle inferior clivus by removing bone posteromedial to paraclival ICA and inferior to laceral ICA [Figure 3]b. The flocculus and the choroid plexus protruding from the foramen of Luschka behind the rootlets of the IX and X nerves and the VII, VIII nerve complex arising from the brainstem anterosuperior to the foramen of Luschka may be seen in the transnasal exposure [Figure 3]c., Transclival exposure gives a direct access to anterior brainstem extending from midbrain to cervicomedullary junction [Figure 3]c,[Figure 3]d, [Figure 3]e. Upper clivus dura can be opened to expose the upper pons, basilar artery, VI, V, and III nerves, superior cerebellar and posterior cerebral arteries, and the basilar apex [Figure 3]c and [Figure 3]d. The lateral limits of this exposure are the paraclival ICAs and the inferior petrosal sinuses. Drilling the bone around the carotid artery allows the artery to be retracted to expose cranial nerves VII and VIII, the medial surface of the Mackle’s cave, and the anteromedial part of the cavernous sinus. Opening the lower clival dura exposes the VAs and their dural entry, proximal segments of the posterior inferior cerebellar arteries (PICAs), median anterior medullary vein, cranial nerves IX XII, olives, and medullary pyramids [Figure 3]d,[Figure 3]e,[Figure 3]f.,, Access to jugular fossa is blocked in front by parapharyngeal ICA and can be accessed in case where medially placed lesion displaces the ICA laterally [Figure 3]f.
Posterior corridor is a direct gateway to dorsal brainstem, cerebellum, foramen magnum, OC1, and atlantoaxial joint. Posterior corridor was studied microscopically and then it was compared with endoscopic anterior corridor to get a 3D view of critical neurovascular anatomy. This corridor was studied in three stages: Muscular, extradural, and intradural. Key landmarks and important relationships of muscles and vascular structures were identified in relation to bony landmarks. To get a wide view of all the deep structures, large skin flap was removed extending from both sides of the neck up to the vertex [Figure 4]a. Muscles of posterior compartment of neck can be divided into three layers, namely, superficial, intermediate, and deep.,,, Superficial layer is mainly formed by trapezius and sternocleidomastoid, taking origin along superior nuchal line running lateral from external occipital protuberance [Figure 1]b. Intermediate layer is formed by semispinalis capitis medially and splenius capitis laterally [Figure 4]b. Semispinalis capitis is broad, fleshy muscle arising from multiple tendons from the tips of the transverse processes of the upper six or seven thoracic and the VII cervical vertebrae, from the articular processes of the three cervical vertebrae above this (C4–C6), and it is inserted between the superior and inferior nuchal lines of the occipital bone [Figure 4]b and [Figure 4]c. Splenius capitis is broad, flat muscle present deep to sternocleidomastoid and inserted along mastoid process of the temporal bone and into the rough surface on the occipital bone just below the lateral third of the superior nuchal line. The muscles of deep layer occupying occipito atlantal space create suboccipital triangle [Figure 4]c and [Figure 4]d. The suboccipital triangle is limited by three muscles; above and medially by the rectus capitis posterior major; above and laterally by the superior oblique; and below and laterally by the inferior oblique. A layer of dense fibrofatty tissue covers the triangle deep to these muscles. The floor of triangle is formed by the posterior AOM and the posterior arch of the atlas [Figure 4]d. The structures in the triangle are the VA with its muscular and meningeal branches and the C1 nerve, both of which lie in a groove on the upper surface of the lateral part of the posterior arch of the atlas. This groove can be converted into arch or tunnel depending on the ossification of arch of atlas [Figure 4]d and [Figure 4]e. There is rich venous plexus around VA, which can have variable communications with other venous spaces and venous sinuses around jugular foramen, foramen magnum, and sigmoid sinus., The atlantoaxial region has inferior oblique muscle superiorly and semispinalis and splenius cervicalis inferiorly and medially, respectively [Figure 4]d. Fibrofatty tissue and rich venous plexus around the vertical segment of VA again fill this area. Another major landmark in this area is thick C2 ganglion, which is intimately related to atlantoaxial joint [Figure 4]f and [Figure 4]g. The dorsal ramus of C2 gives rise to the greater occipital nerve, which passes through the semispinalis capitis to reach the posterior scalp. The VA after coming out of transverse foramen of the atlas deviates laterally to reach the transverse foramen of the atlas, which is situated further lateral than the transverse foramen of the axis. VA above the transverse process of atlas takes a sharp medial bend to travel across groove on the upper surface of atlas before it penetrates dura. This bend is also intimately related to the medial side of RCLa muscle [Figure 4]e,[Figure 4]f,[Figure 4]g. After passing medially above the lateral part of the posterior arch of the atlas, the artery enters the vertebral canal by passing below the lower, arched border of the posterior AOM; this transforms into osseofibrous ring on the upper groove of atlas which may ossify into a complete or incomplete bony canal surrounding the artery. Bone was removed widely extending from external occipital protuberance and superior nuchal line to foramen magnum. Posterior arch of atlas was removed along with posterior elements from the rest of cervical vertebra. Jugular tubercle was removed on one side to give a comparative view against the other side. After this, dura is opened over cerebellum and cervical spine. This gives a panoramic view of cerebellum, cervicomedullary junction, and cervical cord from dorsal aspect [Figure 5]. Cerebellum can be gently lifted with retractor to get an unobstructed view of intracranial course of VII–XII cranial nerves. VII, VIII nerve complex is seen entering internal acoustic meatus [Figure 5]a and [Figure 5]b. Just below and posterior to it, one can see IX, X, and XI nerves coursing toward jugular foramen. Dorsal rootlets of cervical spine are seen traveling intradurally [Figure 5]a. Muscles over mastoid are reflected to follow IJV, ICA, and extracranial part of the lower cranial nerves into the neck. VA is seen piercing the dura where it is encased in a fibrous tunnel that binds the posterior spinal artery, dentate ligament, first cervical nerve, and the spinal accessory nerve to it [Figure 5]c.,, At the CVJ, the dentate ligament is located between the VA and ventral roots of C1 anteriorly and the branches of the posterior spinal artery and spinal accessory nerve posteriorly, and it is often incorporated into the dural cuff around the VA [Figure 5]b and [Figure 5]c. The most rostral attachment of the dentate ligament is located at the level of the foramen magnum above where the VA pierces the dura and behind the XI nerve, although the dentate ligament is located anterior to the XI nerve at lower levels [Figure 5]b and [Figure 5]c. The rootlets forming the spinal portion of the XI nerve, which arise from the cervical portion of the spinal cord midway between the dorsal and ventral rootlets as far caudally as C5, unite to form a trunk that ascends through the foramen magnum between the dentate ligament and the dorsal roots and enter the posterior fossa behind the VA [Figure 5]c,[Figure 5]d,[Figure 5]e. Jugular process, which forms the posterior margin of the jugular foramen, can be removed to expose the transition between the sigmoid sinus, jugular bulb, and IJV. Here, IJV can be reflected to show course of IX, X, and XI cranial nerves just after coming out of jugular foramen. XII nerve joins these nerves immediately after coming out of hypoglossal canal. These nerves are here anteromedial to RCLa muscle and anterolateral to occipito atlantal joint [Figure 5]f.
Occipital condyle, supracondylar bone with hypoglossal canal, and jugular tubercle were taken out anteriorly by endonasal approach as described earlier. This gives better orientation of lower cranial nerves in relation to VA [Figure 6]a,[Figure 6]b,[Figure 6]c,[Figure 6]d. Dural cuff of jugular foramen and hypoglossal canal was removed carefully while preserving cranial nerves [Figure 6]e,[Figure 6]f,[Figure 6]g. The rootlets of the XII nerve originate ventral to the inferior olive and join in hypoglossal canal before exiting the hypoglossal canal [Figure 6]b and [Figure 6]c. It exits the hypoglossal canal and joins IX, X, and XI nerves below the jugular foramen in the interval between the ICA and IJV [Figure 6]b. IX nerve can be seen passing anteriorly in a separate subcanal in jugular foramen, whereas X and XI nerves pass together in separate subcanal of jugular foramen [Figure 6]e and [Figure 6]f. After the IX nerve exits the jugular foramen, it turns forward, crossing the lateral surface of the ICA deep to the styloid process. At the level where X and XI nerves exit the jugular foramen, they are located behind the IX nerve on the posteromedial wall of the IJV [Figure 6]d and [Figure 6]e. As the X nerve passes lateral to the outer orifice of the hypoglossal canal, the XII nerve joins it medially [Figure 6]c and [Figure 6]e. The accessory nerve departs the vagal ganglion after it exits the jugular foramen and descends obliquely laterally between the ICA and IJV and then backward across the lateral surface of the vein to reach its muscles [Figure 6]f and [Figure 6]g.
CVJ is a collective term that refers to occipital bone, atlas, and axis, with its supporting ligaments and membranes that provide stability and mobility to this critical area of transition between brain and spinal cord. This unique anatomical configuration of CVJ allows its functional mobility and at the same time provides protection to critical neurovascular structures through a wide range of motion in various directions. A thorough understanding of 3D anatomy and relations of various neurovascular structures is paramount for surgical management of these pathologies. There is renewed interest in anterior approaches with recent advances in endoscopic technology. Traditionally, transoral approach has been the most direct approach without any undue neurovascular manipulation to extradural lesions in clival and ventral CVJ. Sometimes, it has been used for intradural lesion too. However, transoral approaches are associated with high patient morbidity and complication rates,, whereas transnasal endoscopic approach offers added advantage of less morbidity of oropharynx and better visuality., In recent times, its feasibility is validated by various cadaveric and clinical studies.,,,,  Complication rates are quite low, and the problem of cerebrospinal fluid leak has largely been overcome with the advent of vascularized pedicle flaps. Endoscopic approach can provide access to the entire skull base extending from anterior cranial fossa to the body of C2 in midline. Lateral exposure is limited here by ET, medial pterygoid plates, and paraclival ICAs. However, with some drilling and removal of bone, more lateral areas can be accessed., Muscles of ventral CVJ are thin and have avascular plane in midline that can be used to retract them laterally or remove them as U shaped flap for later reconstruction. Anterior tubercle of C1 is a useful midline landmark that can be confirmed with image guidance. OC1 joints act as lateral limit of this exposure. Although no biomechanical studies have been performed addressing the stability of the OC1 joint after ventromedial condyle resection, statistically significant hypermobility is produced at the OC1 joint after more than 50% of the dorsomedial condyle is resected. Transverse ligament is thick, white transverse band that can be identified easily after the removal of odontoid. It can sometimes be confused with transverse occipital ligament that can be present in up to 8%–40% of cases., Transverse ligament extends between lateral masses of C1 whereas transverse occipital ligament extends between occipital condyles. For endonasal endoscopic approach to foramen magnum, inferior clival, and petroclival fissure, superior limit is paraclival and laceral segment of ICA and inferior limit is occipital condyles. Hence, a standard endoscopic endonasal approach to the inferior third of the clivus has a trapezoid shape, determined by the narrower space between the condyles inferiorly. Drilling occipital condyle on one or both sides can extend this operative corridor. Far medial extension of transclival approach with its two modifications, namely transcondylar and transjugular approach offers visualization of dural entry point of VA and cisternal part of lower cranial nerves., The hypoglossal canal is situated posterior to the level of the supracondylar groove, with its outer orifice located lateral to the level of the supracondylar groove. Hence, superior and inferior clival lines, pharyngeal tubercle, OC1 joint, C1 tubercle, supracondylar groove, hypoglossal canal, and jugular tubercle are some of the useful bony landmarks to be identified in this dissection. Limitation of these approaches is mainly narrow corridor with restricted movements due to nasal anatomy. They have largely been overcome with advancement in instrumentation and removal of nasal septum and turbinates. However, ET, configuration of pharyngeal ICA, and occipital condyles are other anatomical limitations, which need to be considered while approaching pathologies located more inferiorly and laterally. Amount of condyle resection and damage to alar ligaments can lead to cranio cervical instability requiring posterior fixation. Tortuous or medially displaced pharyngeal ICAs can make this approach impossible and it needs to be considered before operation, especially in elderly patients. Another limitation of this approach is inferior extent of pathology. Lesions extending below C2 vertebra are difficult to access by this approach. Another absolute contraindication for transnasal endoscopic approach is medially or ventrally located critical neurovascular structure requiring their handling before entering the lesion. For accessing lateral pathologies or lesion behind occipital condyles, a lateral or posterior corridor is preferred over anterior corridor. Posterior approaches to CVJ are more traditional approach to deal with pathologies related to dorsal brainstem cerebellum and spinal cord, jugular foramen, foramen magnum, OC1 joint, and atlantoaxial joint. For any type of joint manipulation, fixation, or instrumentation, posterior approach is preferred over direct approach.,,, VA is the major vascular structure encountered in this corridor. VA adopts a serpentine course in relation to CVJ region. This artery has multiple loops and has an intimate relationship with atlas and axis. Venous plexus and thick connective tissue cover the entire course in this region, making its identification difficult during surgery., However, some useful landmarks can help in early identification and safety of this major vessel. Suboccipital triangle is a useful landmark to identify and locate horizontal segment of VA as it travels across groove on the upper surface of the posterior arch of atlas.,,, Another major landmark in this area is thick C2 ganglion, which is intimately related to atlantoaxial joint. Many times, for better exposure of atlantoaxial joint or instrumentation in this region, C2 ganglion can be sacrificed. VA after coming out of transverse process of C1 takes a sharp medial bend to travel across groove on the upper surface of C1 before it penetrates dura. This bend is also intimately related to the medial side of RCLa muscle.,, We found RCLa muscle to be of critical importance and important landmark in various corridors around CVJ. This muscle acts as a useful landmark in approaches to jugular foramen, far lateral approaches, and extended anterior approaches too [Figure 4]e and [Figure 4]g. RCLa muscle provides a landmark for estimating the position of the jugular foramen and the facial nerve, which exits the stylomastoid foramen just lateral to the jugular foramen. IJV with lower cranial nerves are anterior to this muscle and VA is posteromedial to it. Occipital condyles are another useful extradural landmark for extended posterior or far lateral approaches. The bone of the jugular tubercle situated above the hypoglossal canal can be removed extradurally to gain additional exposure. The basic far lateral approach without drilling of the occipital condyle may be all that is required to reach some lesions located along the anterolateral margin of the foramen magnum. However, it also provides a route through which the transcondylar, supracondylar, and paracondylar approaches and several modifications of these approaches can be completed. A more extensive removal of the articular surfaces and condyles can be done to gain access to extradural lesions situated along the anterior and lateral margins of the foramen magnum. In the transtubercular variant of the supracondylar approach, the prominence of the jugular tubercle that blocks access to the area in front of the IX, X, and XI cranial nerves is removed extradurally to increase visualization of the area in front of the brainstem and to expose the origin of a PICA that arises from the distal part of the VA near the midline. Muscles that are especially significant in this exposures are the three muscles forming the suboccipital triangle and the levator scapulae, RCLa, and the posterior belly of the digastric. In obliterating and coagulating the venous plexus around the VA, there is a risk that some of the branches of the VA, which arise in an extradural location or even a hypoplastic VA, might be occluded or divided. The posterior spinal artery, and uncommonly the PICA, may arise extradurally in the region of the portion of the vertebral venous plexus. Another key aspect of this approach is the condyle drilling, which requires an understanding of the relationship of the hypoglossal canal to the occipital condyle. In drilling the upper posterior portion of the condyle, the posterior condylar vein may be a source of bleeding, which could be mistaken for bleeding from the venous plexus in the hypoglossal canal. The extradural removal of the jugular tubercle should be performed with caution because of the risk of injuring the IX, X, and XI cranial nerves that hug and often course in a shallow groove at the site where they cross the tubercle. An excellent landmark for identifying the jugular process is the RCLa muscle, which extends upward just behind the jugular bulb. The muscle is located medial to the site where the occipital artery enters the retro mastoid area by passing between the RCLa and posterior belly of the digastric. The posterior belly of the digastric muscle, which attaches along the digastric groove just posterior to the stylomastoid foramen, provides a useful landmark for identifying the VII nerve. A limited or more extensive mastoidectomy may be completed, depending on the length of the mastoid segment of the facial nerve to be exposed and the extent to which the bone on the lateral aspect of the jugular bulb must be removed. Hence, RCLa, posterior belly of digastric muscle, occipital condyle, jugular process, hypoglossal canal, and jugular tubercle are useful bony and muscular landmarks to be identified in this dissection of lateral corridor. This cadaver study has been done to better elucidate 3D anatomy of CVJ and relation of critical neurovascular structures to specific bony and muscular landmarks. A combined view of microscopic and endoscopic relation of CVJ anatomy is more useful and easy to understand. With advances in endoscopic and microscopic techniques, access to lesions and bony anomalies around CVJ is becoming easier and straightforward. This anatomical knowledge and dissection in cadaver lab will assist future neurosurgeons in developing combined approaches and facilitating safe surgery in this difficult to access region of human body. We would like to thank Dr. Juan F. Miranda for his guidance and Wendy Fellow for technical assistance in dissection laboratory. Apuzzo ML, Weiss MH, Heiden JS. Transoral exposure of the atlantoaxial region. Neurosurgery 1978;3:201 7. Rhoton AL Jr. The far lateral approach and its transcondylar, supracondylar, and paracondylar extensions. Neurosurgery 2000;47 3 Suppl: S195 209. Rhoton AL Jr. The foramen magnum. Neurosurgery 2000;47 Suppl 1:S155 93. Cavallo LM, Cappabianca P, Messina A, Esposito F, Stella L, de Divitiis E, et al. The extended endoscopic endonasal approach to the clivus and cranio vertebral junction: Anatomical study. Childs Nerv Syst 2007;23:665 71. Crockard A. Transoral approach to intra/extradural tumors. In: Sekhar L, Janecka IP, editors. Surgery of Cranial Base Tumors. 1st ed. New York: Raven Press; 1993. p. 225 34. Crockard HA, Sen CN. The transoral approach for the management of intradural lesions at the craniovertebral junction: Review of 7 cases. Neurosurgery 1991;28:88 97. Goel A, Desai K, Muzumdar D. Surgery on anterior foramen magnum meningiomas using a conventional posterior suboccipital approach: A report on an experience with 17 cases. Neurosurgery 2001;49:102 6. Goel A, Laheri V. Plate and screw fixation for atlanto axial subluxation. Acta Neurochir (Wien) 1994;129:47 53. 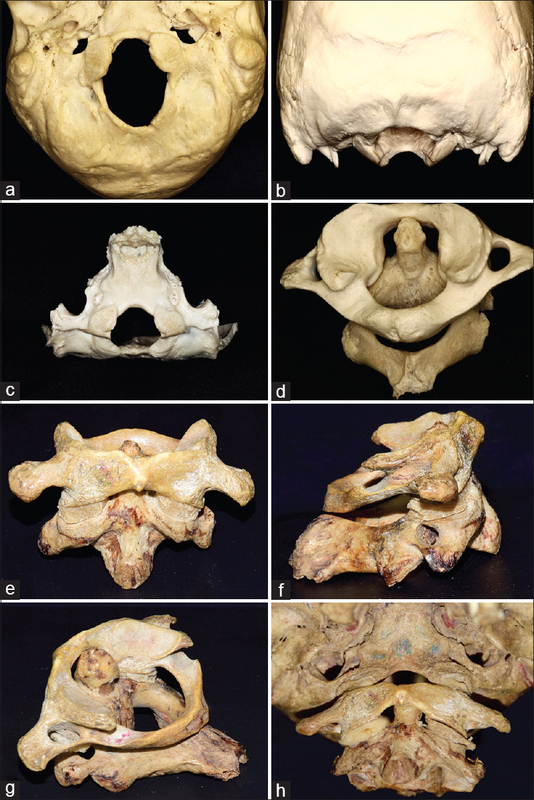 Kawashima M, Tanriover N, Rhoton AL Jr., Ulm AJ, Matsushima T. Comparison of the far lateral and extreme lateral variants of the atlanto occipital transarticular approach to anterior extradural lesions of the craniovertebral junction. Neurosurgery 2003;53:662 74. 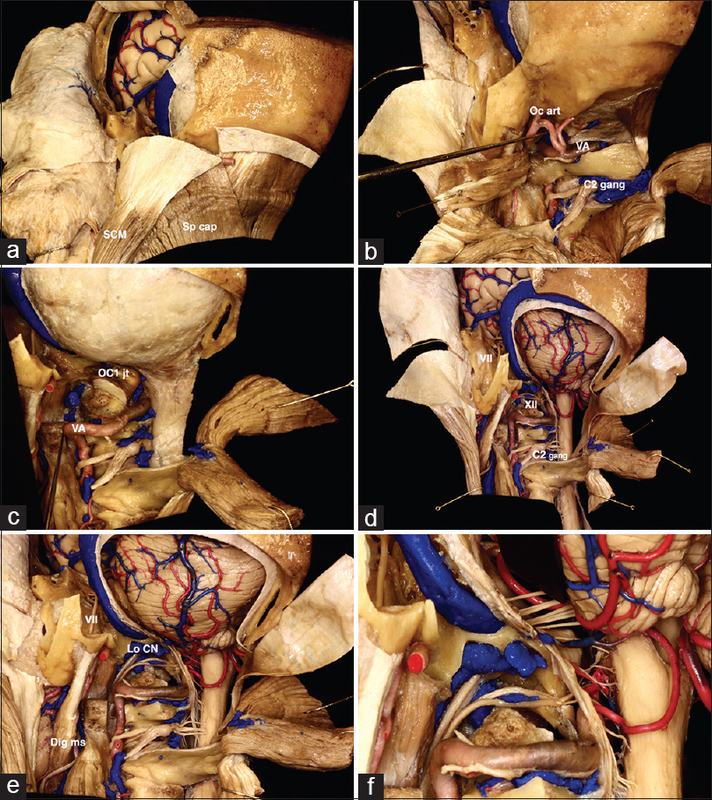 Alfieri A, Jho HD, Tschabitscher M. Endoscopic endonasal approach to the ventral cranio cervical junction: Anatomical study. Acta Neurochir (Wien) 2002;144:219 25.
de Divitiis O, Conti A, Angileri FF, Cardali S, La Torre D, Tschabitscher M. Endoscopic transoral transclival approach to the brainstem and surrounding cisternal space: Anatomic study. Neurosurgery 2004;54:125 30. Fernandez Miranda JC, Morera VA, Snyderman CH, Gardner P. Endoscopic endonasal transclival approach to the jugular tubercle. Neurosurgery 2012;71 1 Suppl: 146 58. Kassam AB, Prevedello DM, Carrau RL, Snyderman CH, Thomas A, Gardner P, et al. Endoscopic endonasal skull base surgery: Analysis of complications in the authors’ initial 800 patients. J Neurosurg 2011;114:1544 68. Labib MA, Prevedello DM, Carrau R, Kerr EE, Naudy C, Abou Al Shaar H, et al. 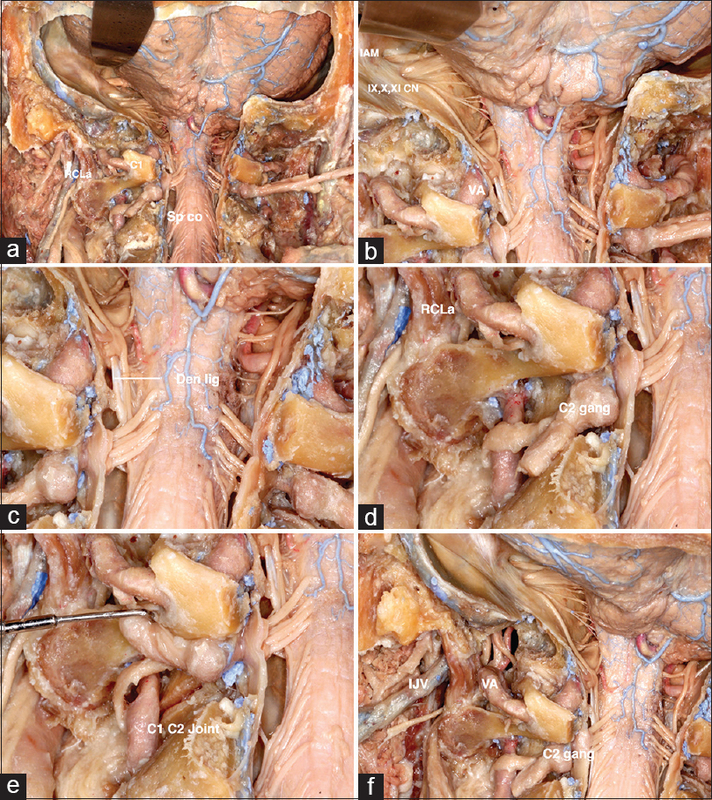 A road map to the internal carotid artery in expanded endoscopic endonasal approaches to the ventral cranial base. Neurosurgery 2014;10 Suppl 3:448 71. Morera VA, Fernandez Miranda JC, Prevedello DM, Madhok R, Barges Coll J, Gardner P, et al. “Far medial” expanded endonasal approach to the inferior third of the clivus: The transcondylar and transjugular tubercle approaches. Neurosurgery 2010;66 6 Suppl: 211 9. Seker A, Inoue K, Osawa S, Akakin A, Kilic T, Rhoton AL Jr. Comparison of endoscopic transnasal and transoral approaches to the craniovertebral junction. World Neurosurg 2010;74:583 602. Fortes FS, Sennes LU, Carrau RL, Brito R, Ribas GC, Yasuda A, et al. 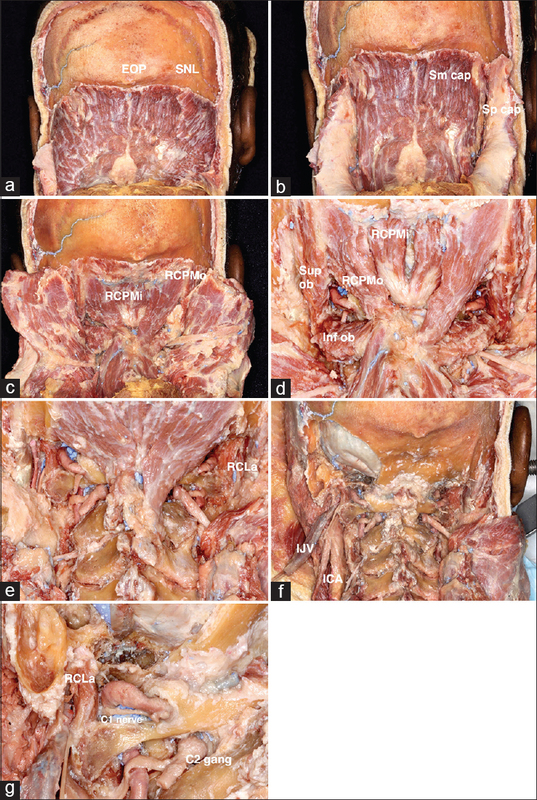 Endoscopic anatomy of the pterygopalatine fossa and the transpterygoid approach: Development of a surgical instruction model. Laryngoscope 2008;118:44 9. Tubbs RS, Hallock JD, Radcliff V, Naftel RP, Mortazavi M, Shoja MM, et al. Ligaments of the craniocervical junction. J Neurosurg Spine 2011;14:697 709. Kassam A, Snyderman CH, Mintz A, Gardner P, Carrau RL. Expanded endonasal approach: The rostrocaudal axis. Part II. Posterior clinoids to the foramen magnum. Neurosurg Focus 2005;19:E4. Arnautović KI, Al Mefty O. 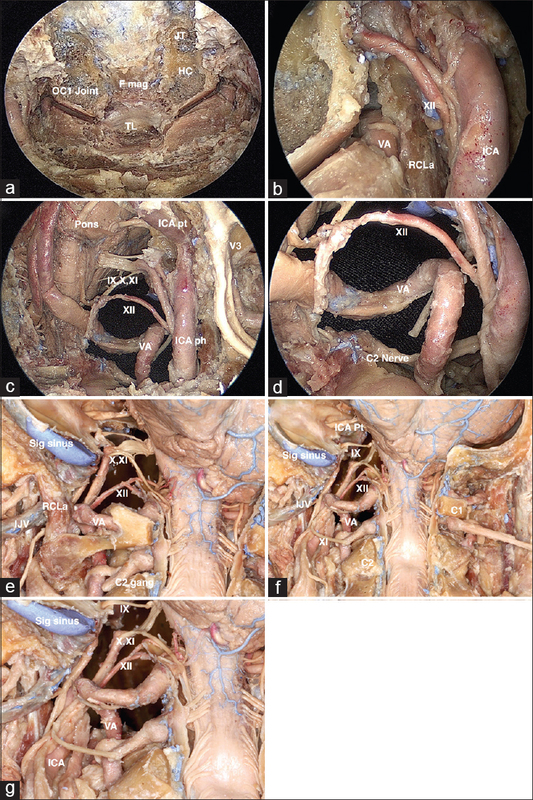 The microsurgical anatomy of the suboccipital vertebral artery and its surrounding structures. Oper Tech Neurosurg 2002;5:1 10. Cacciola F, Phalke U, Goel A. Vertebral artery in relationship to C1 C2 vertebrae: An anatomical study. Neurol India 2004;52:178 84.
de Oliveira E, Rhoton AL Jr., Peace D. Microsurgical anatomy of the region of the foramen magnum. Surg Neurol 1985;24:293 352. Rhoton AL Jr. Jugular foramen. Neurosurgery 2000;47 3 Suppl:S267 85. Kassam AB, Thomas A, Carrau RL, Snyderman CH, Vescan A, Prevedello D, et al. Endoscopic reconstruction of the cranial base using a pedicled nasoseptal flap. Neurosurgery 2008;63 1 Suppl 1:ONS44 52. Vishteh AG, Crawford NR, Meltona MS, Spetzler RF, Sonntag VK, Dickman CA. Stability of the craniovertebral junction after unilateral occipital condyle resection: A biomechanical study. J Neurosurg Spine 1999;90:91 8. Goel A, Bhatjiwale M, Desai K. Basilar invagination: A study based on 190 surgically treated patients. J Neurosurg 1998;88:962 8.